For awhile this one was fairly scarce, having quickly gone out of stock at Amazon, never sold directly through Activision's site, and not really available anywhere else. But someone seems to have uncovered cases of them recently, as they're everywhere on eBay nowadays. You can get an unopened one for as low as $10 plus shipping. The box is attractive from an old-skool standpoint. Unlike Zork Grand Inquisitor, this one actually has the Infocom logo on the package. It's done in the familiar grey-box style, though thicker, but the box is very light, containing only a CD and its envelope (not even a jewel case), and easily pressed in, so be careful that you get one in good shape. All of the documentation and prop scans are in Acrobat PDF files on the disc. 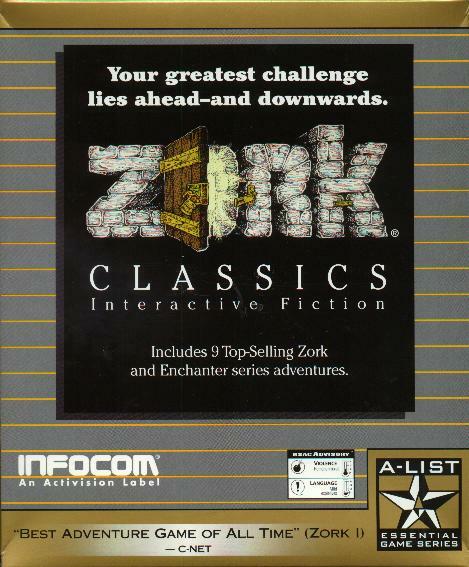 This was published as part of Activision's "A-List" series (their equivalent of Electronic Arts' "CD-ROM Classics"), which also contains, among others, Zork Nemesis and Spycraft.